Ramadan 2018, another year, another celebration. It is the holiest month for Muslims where they fast, give charity and improve themselves. If you want to know more about Ramadan check my previous posts: 9 things Muslims are guilty of during Ramadan and Traveling while fasting. Ever wonder what Ramadan is like for Muslims around the world? I asked 8 Muslims to find out. Their responses were phenomenal and I am excited to share them with you. To enjoy this interview, first, click=> post and open it in a new tab to use as a reference for the vices each person is guilty of. Aminat Matemilola is a business development analyst, digital marketing consultant and entrepreneur. She has a strong passion for social and economic development and aims to be an entrepreneur. She enjoys volunteering, photography, traveling, doing research and writing in her free time. On a scale of 1 – 10 how excited are you for Ramadan? 10 – I fast Mondays and Thursdays regularly so I am used to fasting often. I am excited that there will be numerous communal iftars (eating after sunset) to attend and not having to worry about what to eat. Planning what and how to eat can be strenuous sometimes. Ramadan is a month where I feel I am closest to God. I think I do more sincere good deeds in this month than in other months because I know the reward is in multiples and it is easier to focus on being closer to God as ‘worldly’ deeds seem secondary. Perform non-exclusive iti’kaaf (special prayer) in the last ten days of the month. I will be going to work during the day and seclude in the mosque at night. Pray Tarawih (night prayer) with Jam’ah (with the community) every night. Attend different lectures/programs in different mosques every weekend. Pray tahajud (Special prayer), recite Quran for at least 50 minutes before Suhur (eating before sunrise). I don’t exactly celebrate Ramadan. Since I already have a fasting habit, I just welcome it and aspire to learn more about the Quran and its teachings by studying its meaning. Based on my post which vice are you guilty of? No. 1 – restraining myself from cursing fellow Lagos drivers. What would you like Non-Muslims around the world to know about Ramadan? It’s the month you’ll find a lot of Muslims wearing their Muslim cap and it may be the best time to learn more about Islam and the Muslim culture. Ramadan is a month of forgiveness, blessings, and mercies. You see it exude in a lot of Muslims. You don’t have to be a Muslim to join in the act. Forgoing eating during the day has its benefits, plus you would have more time to focus on other things and you get to experience what over half the population experiences every day – hunger! For me it primarily means a month in which I can binge worship and improve my dedication to Allah (God). It’s also a time that allows me to cleanse myself mentally, spiritually and physically. I for example pay extra attention to what I eat during the allowed time. Also I try to give back more, be more patient, kind and I try to eliminate bad habits and acquire good ones. I always have so many, which frankly is unreasonable, but I prefer to aim high and if I then only reach 70-80% I’ll be satisfied. The main goal is to read the entire Quran, pray my prayers on time, attend as many Taraweeh (Night prayer) prayers every day, give back every day and eat healthy while balancing it all. How many hours do you fast for? Ramadan for me is more of a sober month, with little celebration. Having said that, every iftar with family and/or friends is a little celebration in itself. Oh and eating dates of course too, it’s one of my favorite foods. Based on my post, which vice are you guilty of? Conserving Energy: I am normally very active, cycling every day, going to the gym a few times a week… etc. During Ramadan however, I dial it down a notch. I try to go to the gym for weightlifting, but less often and definitely no cardio. I try to retain as much energy as possible throughout the day so I can continue to deliver strong performance at work. Esra Alhamal is a Saudi designer and travel blogger based in London. 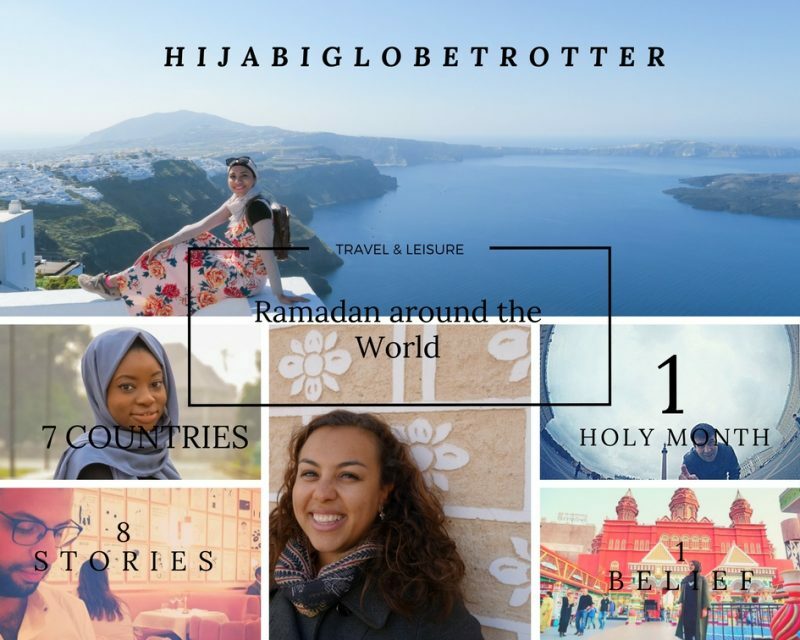 She blogs about her travel experiences as a Muslim female traveling solo or with friends. Her main focus is on well designed, artistic, fun experiences and destinations that are suitable for modern, active Muslims. Esra just started Travelling Muslimas to inspire more Muslim females to travel. DM her to be featured on there. It’s a month of fasting, Quran, and traditional foods. I wish I planned my year better to make the most out of Ramadan spiritually but hoping to make the most of the month! My usual goal for the month is to read the Quran completely (1 chapter a day). I also try to go to the mosque for the religious occasions during the month such as the night of destiny. There are two things that make this month very distinctive for me from the rest of the year: the extra spiritual focus and the traditional food. Ramadan is a Muslim practice to train the soul of a Muslim to be more aware of different aspects of life. The Ramadan culture in some Muslim countries is not always a true representation of what the month promotes. Some people, unfortunately, contribute to food waste and that is the opposite of what Ramadan is about, but we are all trying! Haneen is an American with Palestinian roots that loves to hop around country-to-country and enjoy good cafes, food, fashion, and well… life! She travels to break stereotypes around ‘the Muslim woman’ Her other reason is to remind herself how small humans are in this world and how amazing God’s creation is. Haneen will be moving to South Korea where she will be volunteering with the refugee communities, either North Korean defectors or Syrians or Afghans etc. Check out her Instagram . Her Youtube videos about makeup/skin care products, K-Beauty products and, Koreans react to…” would be coming out soon. 1837483 hahaha. I am always looking forward to this blessed and mercy filled month. Ramadan is the month where if you haven’t lived as a practicing Muslim you can have a new start. It doesn’t have to be limited to this month but for some reason (maybe those chained devils) this is the turning point for lots of Muslims. Ramadan is also the month of mercy, self-improvement, feeling with the needy, and bountiful blessings (Hellooo Laylatul Qadr). Having those devils chained and seeing who you really are is enlightening. Not to mention, those wide-open heaven “gates”, yes please! —not sure when I’ll die but I hope its during Ramadan. I have been very busy with this Dunya (Life) and have been falling behind on my deen (Religion). We get so busy trying to live this life that we forget to work for our akhirah (hereafter). I hope to catch up during this month, read Quran, be stricter about my prayers, volunteer with the refugees in our community, and bond more with my family. I am not expecting to become a perfect Muslim but rather working on what I have and what I’m lacking in. There is no celebration per say but rather small things here and there. We used to put up Ramadan lights outside the house and within the home. There are usually lots of iftars where we get together. Ramadan in the USA isn’t that same as overseas, it’s much quieter. Overseas has more of a festive feel to it. You’d have the family gatherings, the passing out the food to the needy, late night outings- with people out and about well past 11 PM, and the beautiful Athan (call to prayer) ringing out along the skies. During Suhoor time a man would come out and hit a drum that wakes the people so that they’ll eat before the sun rise and then pray fajr (Morning prayer). When it’s not the devil whispering in your ear it’s your own inner voice. Folks, this is an awesome month to take advantage of your Muslim bud’s generosity, ok kidding, but people do get nicer *ahem ahem*. You guys should also try fasting with us, not a full day or anything but the sentiment behind the action means a lot to us. Fasting is good for your mind and body, literally, scientifically, whatever you want. Look it up! While most Muslims fast but there are cases where you don’t have to/can’t; pregnant/breastfeeding, sick or ill, females on menses, traveling farther than 48 miles/ 80 km, and children. For most of us, we start fasting at a young age so it really isn’t that hard, of course, this varies by person. For me it is easy, my main issue would be my beloved water that I can no longer gulp freely and those last torturous minutes before we feast (Lol). There are lots to tell you but luckily most of it can be searched online these days. Ihsan hopes to inspire Muslims to travel and explore the world by sharing her personal pictures of places she has visited. Her focus is to travel to Non-Islamic countries. She wants to show Muslims that there are Halal opportunities everywhere even in Non-Islamic countries. I live in Denmark. I was born and raised there. I have lived in Malaysia and Spain for short periods of time due to studies. I love Ramadan and always look forward to getting the opportunity to experience Ramadan every single year. I would scale it on 9, since the only “negative” part is the low energy during the day. Ramadan is, for me, a month where the focus is on getting closer to God and being more spiritual. Further about spending time with loved ones and sharing a lovely meal together. My goals for Ramadan are to attend to Taraweeh-prayer as often as possible and focus on spirituality more than preparing and eating meals. My goal is to eat healthy, only drink water and try to exercise a bit before iftar (eating time). Donate what I’m able to donate, help where I can help, organize iftar at the mosque, and iftar for my friends at home. We fast approx. 19,5 hours. Fajr is about 2,30AM and Maghreb is about 9.45PM. By eating at the dinner table with family. We rarely eat together at the dinner table when it isn’t Ramadan. By eating Ramadan “delights” such as Moroccan soup called Harira, Moroccan sweets such as Chebakiya, Sfouf etc. Based on my which vice are you guilty of? Number 4: No gym for me during Ramadan because of the long fasting hours. I did before Ramadan planned to exercise 20 minutes before iftar – but that has still not happened (It is now day 15 of Ramadan haha). Number 7: No Muslim will ever skip iftar. I do though have to work during Iftar 2-3 times during Ramadan, but that doesn’t mean that I will skip a meal. Regardless, the meals are much smaller than imagined during the day haha! Ahlam & Mohamed are French Muslim Travel bloggers who Love to meet people and learn about different cultures. They are the Founders of muslimtrip.fr where they share all their tips and tricks to help Muslims travel while respecting their religious principles. We were born and live in Paris, France. Of course 11! We especially love this period where time is suspended … all our senses are awake. It is also a period when deprived of food we feel only hunger but also the feelings of the needy. We naturally become even more attentive, empathetic and generous. We love this period that it passes by too quickly for us! Although my children are still too young to fast, we try to involve them in this period. Our goal is to initiate them into fasting. A special atmosphere is set up at home where all their activity revolves around Ramadan. As an individual, it is an opportunity to enrich and purify one’s soul. During the Ramadan period, I like to create a special atmosphere at home. I listen to the Qur’an every day and put Saudi Arabian incense! I just love it! Based on my post which vice you are guilty of? I confess! I’m guilty of vice # 5: Watching the food channel: I love cooking and discovering the different cuisines of the world. Our iftars in Ramadan period are from around the world. I like to draw inspiration from Turkish, Moroccan, Indian or Japanese iftar! The depth of our act of worship that Ramadan represents. Beyond fasting, it is a period of deep meditation that only those fasting can feel. That is why I am always delighted to see curious people who test the experience of Ramadan and conclude its benefits. Come and share an Iftar with us! A month of soul purification, kindness, giving. To make it better than the previous Ramadans. Ramadan is a month of Fasting, intensive worship, giving charity, purifying one’s behavior, and doing good deeds. It is also a way to experiencing hunger, developing sympathy for the less fortunate, and learning thankfulness and appreciation for all of God’s bounties. Ramadan helps us in break the cycle of rigid habits. Born in Ireland and raised in Southern California, Sally of Passport & Plates has been a traveler from the start. She boarded her first flight when she was just 10 days old and hasn’t stopped traveling since. Growing up Arab and Muslim in the U.S. has made her no stranger to cultural clashes, and summers spent learning to cook resulted in her deep appreciation for all types of cuisine. She’s a firm believer that local food and travel experiences are the best forms of education. Connect with Sally on Facebook, Instagram and her Webpage. To me, Ramadan is unity. It’s the time when the entire community collectively unites to fast, give zakat and work on being better Muslims. Attending more Taraweeh instead of basking in a food coma. Being with my family during Ramadan is something I prize above all. We always pray Maghrib (Evening Prayer) together and eat together, and there are certain foods that are always at Iftar: ful (fava beans), dates (of course), and hummus. Plus, homemade juices. To us, the celebration is the community feel – it’s the one month per year that everyone does their best to eat together. LOL, I ALWAYS know when Maghrib is, down to the minute. Being someone who loves food, I definitely struggle with taming my hanger during Ramadan (I guess I should add that to my Ramadan goals). Fasting is more than just giving up food and drink. It’s a time for charity, unity, and spirituality. I loved this post! Thank you for introducing me to more Muslim bloggers. And the unity felt with observations of Ramadan all around the world. It was lovely, truly! Ramadan Mubarak! Thank you for educating me more about Ramadan. I live in the center of the United States, and I don’t know anyone personally who is Muslim. There is a Mosque in my town, though. This has made me consider why I don’t try to learn more and meet more people. This article was really informative.